You may rue the day that Facebook introduced song sharing (now we all know about your insatiable appetite for the High School Musical soundtrack), but Facebook's pretty pleased with it, having racked up five billion song shares since f8 in September. Speaking at the Midem conference in Cannes, Facebook's Dan Rose didn't elaborate much, so we don't know how much of the five billion is down to Spotify and how many song shares have come from partnerships with other music services like Deezer. Last we'd heard, Facebook reported 1.5 billion tracks had been shared using Spotify in November 2011; whichever way you look at it, 3.5 billion tracks in two months is good going. Now that Facebook is rolling out Timeline to all its users, this kind of seamless social sharing is only set to grow. Other companies have already come on board, with Netflix taking care of your movie-watching and Zeebox handling your TV habits and over sixty more new apps to keep your friends posted on everything from what gigs you're at to what food you're eating. 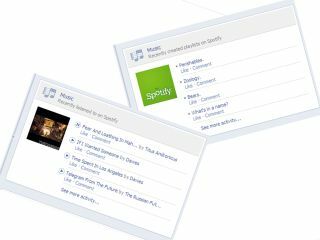 But with bite-sized song sharing overtaking the Facebook ticker, who knows whether we'll even notice all that. Now, excuse us, we're off to switch private listening on.